Cuba remains volatile, a powder keg that's got the full attention of the White House. 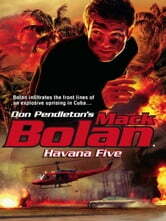 Mack Bolan's soft probe into a missing Pentagon official tracking Colombian ELN terrorist camps inside Cuba goes hard when his cover is blown. The connection between a notorious Cuban underworld cartel, Havana Five, and a growing army of leftist insurgents puts Stony Man and Washington on high alert. And with U.S. and global interests in jeopardy and a bloodbath just a hair trigger away, the situation is turning critical. Bolan, flanked by two of Stony Man's crack operatives, turns up the heat with a battle plan that hasn't failed yet-infiltrate, identify and destroy.